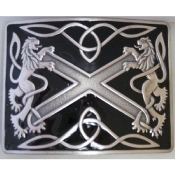 St. Andrews cross in center with Rampant Lions flanking each side. Black enamel inlay and antique silver finish. Fits 2 1/4" standard kilt belt. Made by Glen Esk.